Our Durable & Versatile Storage Solutions Are Ready For Your Work Site. For remote work sites with unknown production lifecycles, our container solutions can withstand harsh weather conditions and are easy to transport, set-up and relocate. Did You Know We Have Workspace Solutions Too? Office container, storage container, ground level offices, GLO’s, by any name, are a tough, secure, and relocatable workspace. Each office container has heavy 14-gauge all corten steel construction walls, solid steel doors and sturdy mesh, steel security screens on windows and a crash bar personnel door. Interior design includes wall mounted J-box for phone/data connection, R21 insulation in office areas, air conditioning and heat installed, fully finished interior walls, fluorescent lighting; with additional customizations upon request. Office containers are for rent or purchase at any of our locations. Learn more. Need a safe place to store your tools? We have your ideal solution for rent or purchase. A Container King tool crib has the same heavy 14-gauge all corten steel construction walls and solid steel doors as our office containers, but also includes a crash bar personnel door. The interior includes three tier metal shelving down both sides, a work bench at one end, full AC/heat, lighting and electrical. A great turn key solution for your worksite. Learn more. Hoardings, or enclosed walkways, offer safety and piece of mind on a construction site. A replacement for scaffolding walkways, a hoarding offers ease of set-up, and will not be affected by heavy winds. The interior includes full lighting and electrical, epoxy sealed floors for heavy traffic, picture frame window openings, and easy transition floor plates and ramps. These hoardings can be customized to fit your needs weather your rent or purchase. Containers can be connected or have spaces in between for additional access points. Learn more. Dangerous goods (DG) storage containers offer a safe, tough, and secure storage solution for your dangerous commodities. 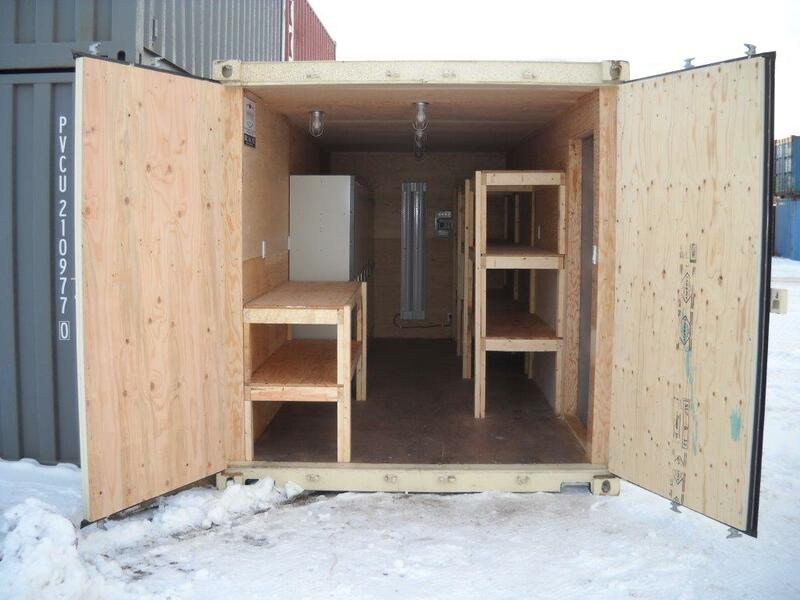 Available for rent or purchase, these containers have doors on both ends and one in the side wall. This doubles as an emergency exit personnel door. Interior design includes two mezzanine decks on one end for smaller container storage, large containment bund, lockable ball valve for decanting, and removable floor grates for cleaning. Learn more. Contact us today to learn more about how we can help find the right container for your next project. Call 800-587-1784 to learn more.